Ghostbusters 2016: A hilarious, visually-pleasing and fun film. Watching it in 3D felt like a Disneyland ride I did not want to end. But this remake has received much criticism. Expected of a reboot to some extent, fans of the 80’s classic generated a lot of heated hate, even prior to the release. The fact of disguised misogyny is unfortunately not surprising, due to the “drastic” transformation in featuring four women in the updated roles of former male characters. Why, in 2016, does it feel so revolutionary to have a female cast that outnumbers the dudes? Chris Hemsworth, indeed a rather beautiful man-person, is one of the few guys. He plays the ditzy secretary character that has for so long plagued female actors, as portrayed in the original movie. It is fun to see this satirized literal role reversal. With Dan Aykroyd on board as an executive producer of this one, there is no merit to persecuting director Paul Feig, or anyone else involved, for “ruining” the original — the original approves. Also look for OG-Ghostbusters cameos. Kristen Wiig plays Erin Gilbert; slightly awkward but lovable, in typical Kristen fashion. Paired with Melissa McCarthy (forever Sookie), they play paranormal enthusiast pals with a ghost-hunting history. And welcome a new generation of Saturday Night Live cast members in Leslie Jones (a former writer for SNL) and Kate McKinnon (a theater grad/full-time babe). They play an MTA worker-turned-Ghostbuster and nuclear engineer, respectively. These two are like kookier versions of Kristen and Melissa, which comes across in some rather entertaining interviews. Within the last decade, the road of hilarious gold has been paved by other SNL alumni, Tina Fey and Amy Poehler — a dynamic duo synonymous with comedy. In their 2016 party-com, Sisters, Saturday Night Live cast past and present make cameos, including Kate McKinnon. Kate is the undisputed reigning queen of the current season and next in the series of funny women dominating the industry. Her exaggerated physical comedy and entirely confident, full-hearted approach to each character makes it impossible to turn away. In Ghostbusters, Kate plays Jillian Holtzmann, the LGBT heartthrob with great outfits and better hair. She owns every scene, including the gun-licking, ghost-fighting action sequence that made me finally understand the appeal of Jason Statham movies. Be still, my heart. 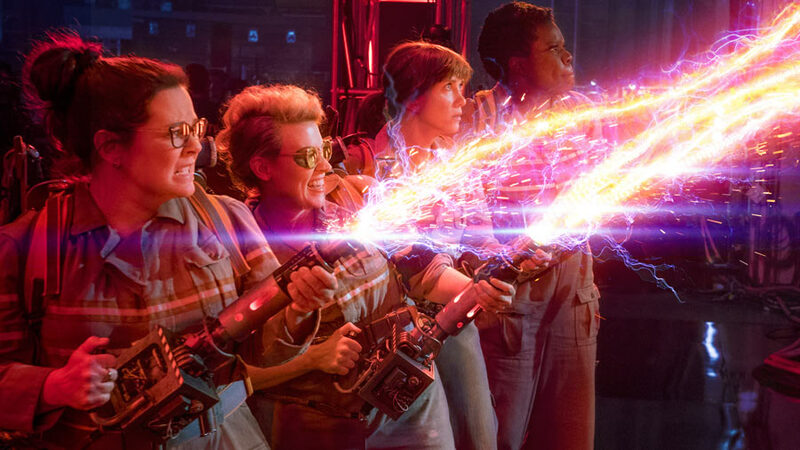 With Ghostbusters‘ PG-rating targeting a younger demographic, it is inspiring to see a new generation of role models and strong female characters emerging in mainstream film. A post-credits bonus scene sets things up for a Ghostbusters sequel that I shall eagerly await. I’m totally going to call, but I’ll wait a while because I don’t want to seem too desperate, you know?